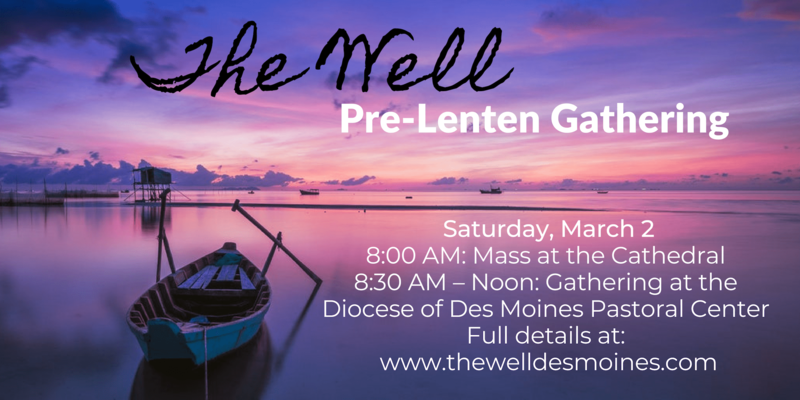 Tickets now on sale for our 2019 Lent at The Well gathering. Click here to be redirected to EventBrite where you can purchase the tickets. The day will begin with 8:00 AM Mass at St. Ambrose Cathedral celebrated by Fr. Andrew Windschitl, pastor from St. Mary-Holy Cross Parish, Elkhart. The Cathedral is located at 607 High Street, Des Moines – adjacent to the Pastoral Center. Immediately following Mass, we will walk across the street to the Pastoral Center, located at 601 Grand Avenue, Des Moines. Doors open at 8:30 AM with a hot breakfast and coffee/tea service catered by Palmer’s; pastries prepared by Katie Wallin. Emily Schmid will lead us in praise & worship music; Stacy Halbach will serve as our emcee. Sara Huegerich opens our discussion on “Searching for and Maintaining Peace” sharing a personal witness, and Katie Patrizio is our keynote speaker. The morning will also include time for fellowship, quiet prayer, and reflection. If you are interested in volunteering at this event, please visit our Sign-Up Genius here. Tickets are on sale through EventBrite. There are two ticket categories. The $30 level includes Fr. Philippe’s book Searching for and Maintaining Peace at a reduced rate. Thank you, Divine Treasures, for providing the discount! The $25 level does not include the book. And, of course, The Well likes to throw in some fun surprises! About the book … It’s one of those highly recommended books all Christians ought to read and have in their home libraries. Thankfully, Divine Treasures is offering a discount to The Well. If you’re looking for something to journey with throughout Lent, we are here to spiritually walk with you. Searching for and Maintaining Peace is a short book (could probably fit in your back pocket), readable, and most appropriate for the Lenten season. Throughout the six weeks of Lent, weekly podcasts will be shared on The Water Jar Podcast featuring a team of local women offering insights and encouragement on the suggested weekly reading. A reading guide will be provided to all women who wish to join. We look forward to spending time with you in faith, fellowship, and fun on Saturday, March 2! Women of all ages are welcome. For moms wondering if teenage daughters can attend, we ask you to prayerfully make that decision. Please take a look at the agenda and discern if our theme and schedule might be beneficial to your daughter’s spiritual growth. Nursing babies under one are welcome. Is this just for Des Moines women? We’ve already heard of friends traveling from Nebraska. We also anticipate that the finest women in Des Moines will be there – a great chance to meet more women who see life the way you do! Is this just for Catholic women? Not at all! Any woman wishing to deepen her friendship with Jesus is welcome. We believe the theme of the morning is relevant for all women of faith. Actually, we would be tickled pink to see an ecumenical group of women gathered together at The Well on March 2. This event is business casual. You may want to bring a sweater to accommodate for fluctuating temperatures. Palmer’s is catering an egg quiche along with fruit and beverage service. Katie Wallin is preparing an array of pastries. A gluten-free and vegetarian quiche will be available. Nothing is mandatory for you to bring. If you have a journal, feel free to bring it along. And maybe a friend, too! The Diocese of Des Moines has provided parking information and a map. Click here to view and print. Nope! We’ll be ready for you to simply share your name at the check-in table. Tickets are non-refundable but absolutely transferable. If you’d like to transfer your ticket, email the name of the woman who is attending in your place to [email protected]. The Well cannot be responsible for the exchange of funds between individuals. You bet! Please visit our Sign-Up Genius here. “The Wellies” welcome new energy into our team. This is a standing invitation. Contact Lisa Schmidt at [email protected].